Since its original release for the Sega Master System in 1989, Wonder Boy III: The Dragon’s Trap has become somewhat a cult classic. With its simple story and solid gameplay it was a game that seemed to be forgotten, until now. Lizardcube and DotEmu have partnered together and brought Wonder Boy: The Dragon’s Trap to the modern age, and this time with a new addition. The game’s classic character, Hu-Man, now has a long-awaited co-star, Hu-Girl. A modern inclusion for a modern game, but should the series have should have stayed in the past? Or has it been re-born for a new audience? You play as the anti-hero, a boy/girl that has turned into a half-human, half-lizard by the Meka-Dragon and your challenge is to find the cure! You must travel across Monster Land, defeating numerous enemies and Dragon bosses along the way, until you can return back to your original form. For starters, Wonder Boy has to be one of the most aesthetically pleasing games in recent memory. The hand-drawn graphics and fluid style of movement is astounding and it’s like I’m watching a cartoon. I wish more games would take note of the amount of care and passion that has clearly gone into every frame of Wonder Boy’s movement. The subtle bounces of hair, the swinging of swords and the diverse styles of each character and enemy seems to be done with a level of skill and care that I haven’t seen in a video game before. It’s incredible. 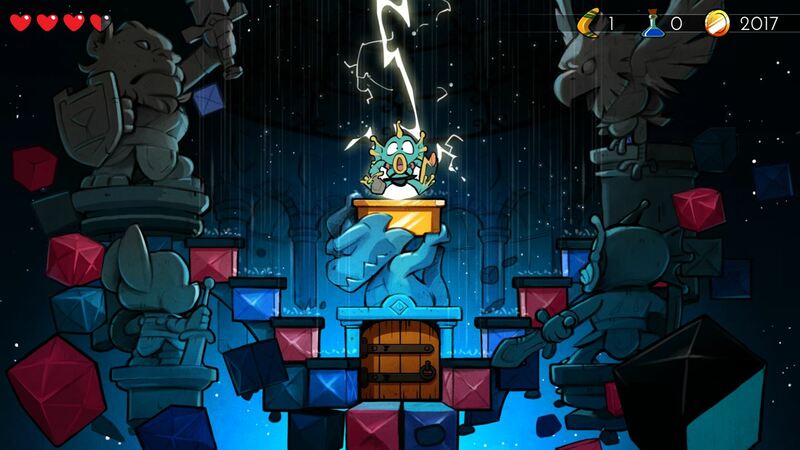 As Wonder Boy: The Dragon’s Trap is based on a game made in 1989, the developers have included an amazing addition to their new version. At the press of a button, RT to be exact, you can seamlessly switch between modern graphics and the retro 8-bit style of the original game. You can also switch the sound to 8-bit audio, allowing you to mix and match whichever sound and visuals you please, and this can all be done during gameplay. Having this option, I’m sure, will delight both the lovers of the original and newcomers alike, as it’s almost like having two games in one. Throughout my playthrough I just couldn’t help but keep switching back and forth from modern and 8-bit music/graphics, marvelling at how gorgeous both versions of the game really are. It’s something I’m sure everyone will be doing. Throughout the game you don’t just stay as either a human or half-human, half-lizard. The more you progress through the vast variety of stages, our shape-shifting hero gets transformed into a mouse, a piranha, a lion and a hawk, with each creature coming complete with its own unique ability that sets it aside from the others. For example, the lizard has a long range fire attack as they cannot equip a sword/shield, meaning you can take out multiple enemies as a distance, drastically reducing the changes of you getting hit. The mouse, however, can walk up certain walls, making manoeuvrability a breeze and escaping enemies a lot easier. There are also powers that every character can use such as a fireball, a whirlwind and arrows – these can all be used to defeat certain enemies and keeps the action nice and varied. As you progress you will pick up new weapons and armour that will increase both the amount of damage you can inflict, as well as the amount you can take, with these being bought with coins you pick up from defeating enemies. They do make a drastic difference in attack and defence and can make certain stages dramatically easier, however, there just wasn’t enough variety in the way these weapons and armour looked. It sounds like a minor element in the game, but I always look forward to getting that new weapon or chest plate and having something to show from my well-earned cash. 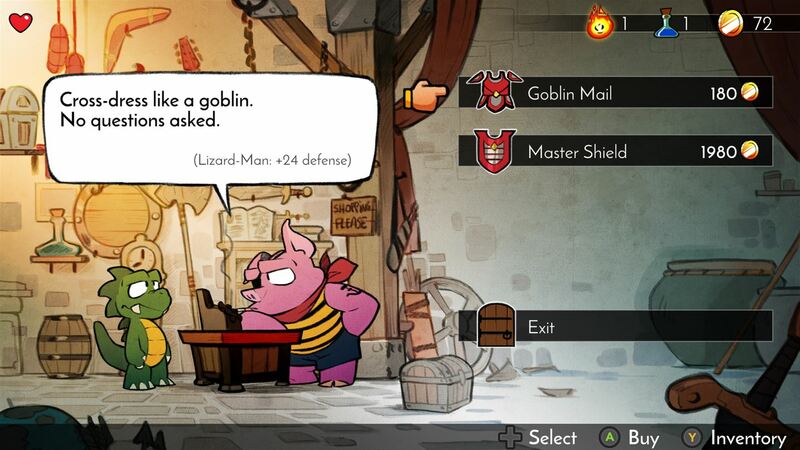 Wonder Boy just doesn’t give me as much drive to want to upgrade as other games do. True to its retro style roots, Wonder Boy has a staggeringly steep difficulty curve. It starts off at a leisurely pace, but an hour or so in it’s utterly demoralising. I died more times than I care to mention but, sadly, unlike other ‘Git Gud’ games like the Dark Soul series where the rewards for beating the near impossible stages are worth every second, Wonder Boy just doesn’t have the same pull. The “reward” is essentially changing creature and that is about it. Walking through these levels with a frustratingly small sword, getting hit over and over again with increasingly unpredictable enemies, and dying over and over again, just turns into something potentially more frustrating, never really drawing me in further or making me want to come back for more. A great new power that could be used again or a badass new weapon, would be lovely – anything that would congratulate me for getting this far in the game would have been much appreciated. 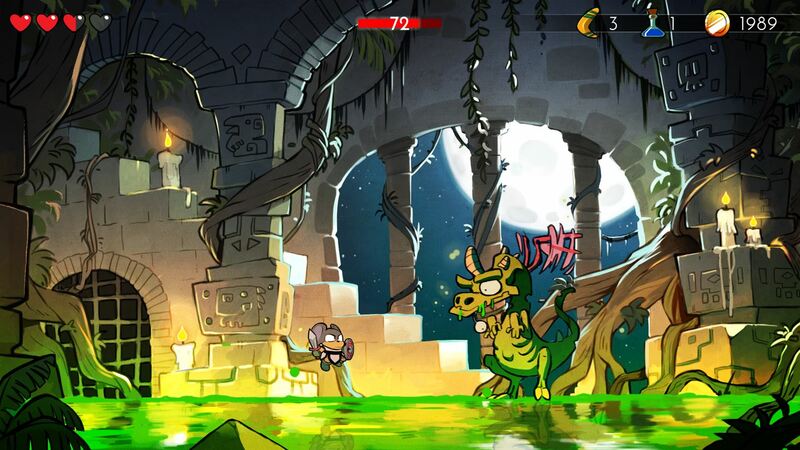 Wonder Boy: The Dragon’s Trap is an astonishingly beautiful game to both look at and play. Its story is as charming as ever and the gameplay doesn’t ever over-complicate itself. The large variety of stages have enough to keep things interesting, while the amount of creatures to play as, with their unique skills, and ability to change from modern to 8-bit graphics at the touch of a button is marvellous. My only gripe with the game is in the lack of rewards for defeating the punishingly brutal levels and bosses and few aesthetic changes with the weapons. These are minor negatives in the grand scheme of things though and I highly recommend you pick up Wonder Boy: The Dragon’s Trap when it’s released!